What do you see when you look at the images to the far right? If you can imagine your business idea (the seed) being planted as per the above picture, then you are a natural entrepreneur; the sort I would like to walk through the fifteen steps to setting up a successful business within the forthcoming weeks. Each week, we will review one or two of the steps in detail. And where I believe it to be necessary, I will give you exercises to do, a practical application of the core learning for the week. Additionally, there will be useable templates at the bottom of each article. Readers are also invited to send in questions; at the beginning of each week, I’ll answer the most popular ones. Before any good gardener plants, he or she firstly prepares the soil, making sure the environment is conducive for the seeds to grow – this is exactly what every budding or veteran entrepreneur must do. An idea may be brilliant, but may fail to meet a gap in the market, or it could be exactly what your potential clientele has been crying out for. However, before you plant your seed, you MUST answer the very pressing question; is your idea financially viable or feasible? Is there a true demand for your service or product (please note, henceforth, idea, product and service will be used interchangeably)? You can achieve this easily, and at minimal cost. Speak to your potential consumers and customers, identify their needs, and ensure your product/service meets those needs. 2 Are you able to create a cheap prototype of your service or product? If yes, does it meet the demands, the expectations of real customers? Make sure the network for your research reaches beyond the stretches of family and friends – these yet to be identified consumers are unbiased and will give you invaluable feedback that will enable improvement of your product. Remember, a negative feedback is just as good as a glowing one. What are potential customers willing to pay for your service or product? Try different price points with various customers, ensure your prices are consistent and realistic. 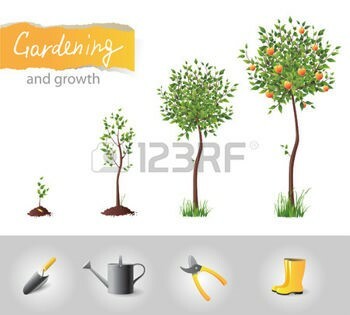 Referring back to our pictures, the yellow and grey gardening items at the bottom of the picture signify the tools required to strategically nurture your idea. These are your business plan, cash flow, profit and loss, etc. Using these tools from the onset will help you grow your idea from a seed into a fruit-bearing tree with longevity akin to an oak’s. The questions listed earlier should help you kick-start your research. The essence of undertaking a research is to gain an in-depth understanding of your target audience. Once you acquire this knowledge, it is priceless! In my career, which has spanned over twelve years, I have found most potential business owners underrate the importance of business research. Although time consuming (a thorough research usually takes a minimum of six months, if you are carrying out the research yourself). Paraphrasing Sophia Amoruso, patience and perseverance are absolutely necessary in this inception stage, and for someone rearing to go, it can be seen as an arduous task –it is the one task you will never stop enjoying its benefits time after time. No matter how well you think you know your future or existing customers, you can never know enough. This is because consumer demands change constantly and you must be able to pre-empt these changes and proactively seek to move accordingly. What you’re going to do with the results. Armed with the above information, I urge you to evaluate the financial feasibility of your idea.